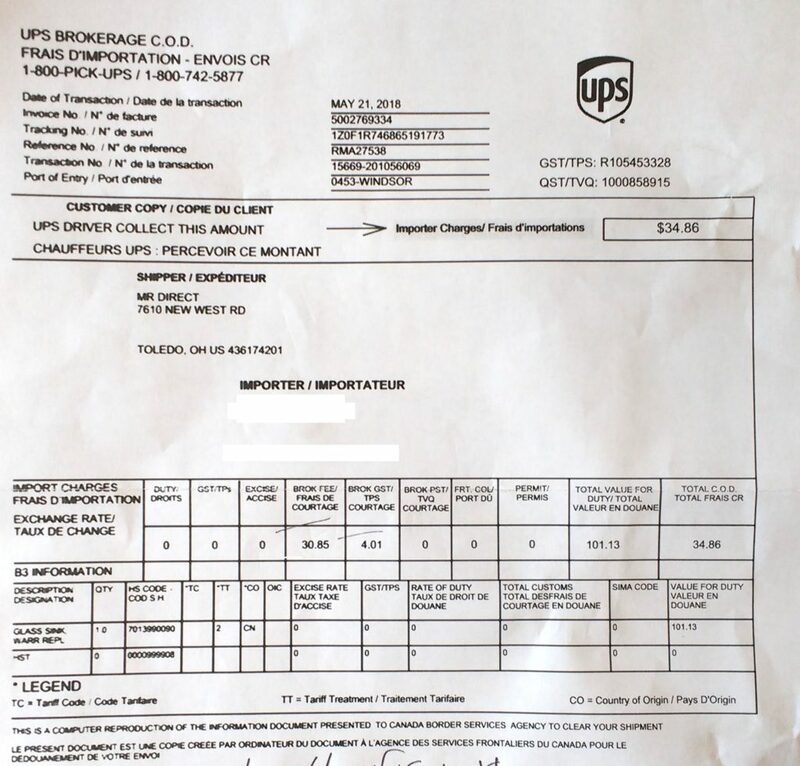 Asking my MP: are UPS customs clearing fees legal? My letter to my MP. I didn’t vote for him, but he is still technically my representative. I don’t usually have any faith that my elected representative has any chance of actually acting favourably on my behalf, but I will temporarily play optimistic. Are you familiar with the customs brokerage scam that UPS and some of the other shipping companies are running on Canadians? DHL and Canada Post also play this game, but not with the same zeal and shear exploitation of UPS. The basic idea behind this scam is that UPS has figured out how to collect from both the shipper and the receiver. 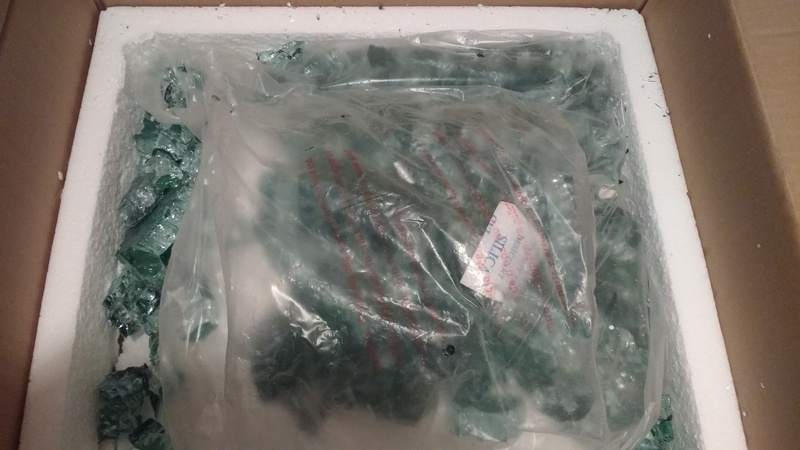 They collect once explicitly from the shipper in the USA, who may even think that they have paid all the required fees to ship the package, and then they collect again from the receiver by claiming that they have provided a “customs clearing service”. UPS has imposed a $61.95 fee to collect this $1.97 for the Canadian government. They bill this extortion as a “service”, so the taxman gets an additional $8.05. Sweet deal for UPS and the taxman, but not for your constituents. 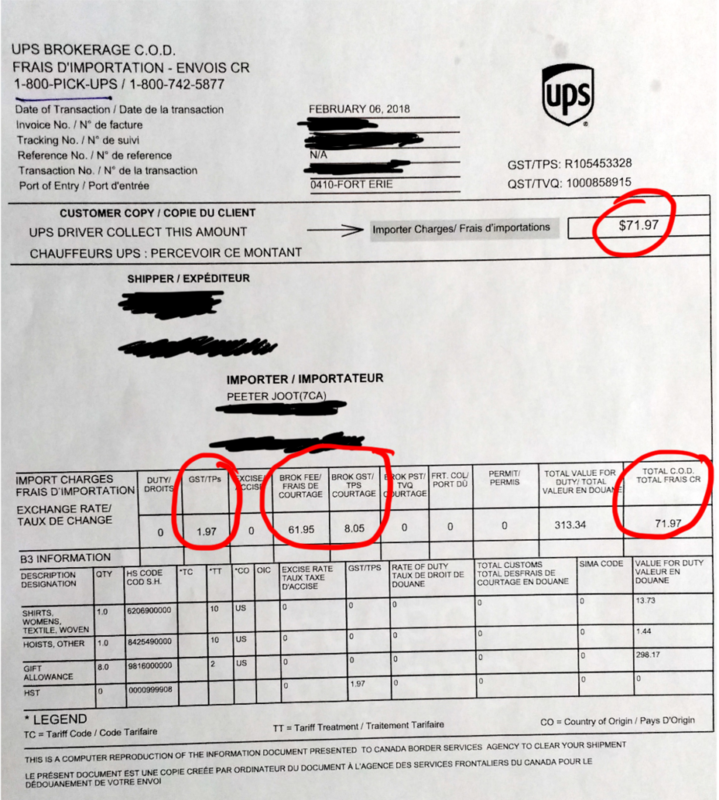 Is it legal for UPS to levy an effective fee of $70 to collect $2 for the government? Are their any federal government regulatory agencies that Canadians can complain to for charges like this? I’m used to being screwed by the Canadian revenue service, but I imagine even those cold hearted bastards would find this objectionable. UPS customs clearing scam hits new extremes! 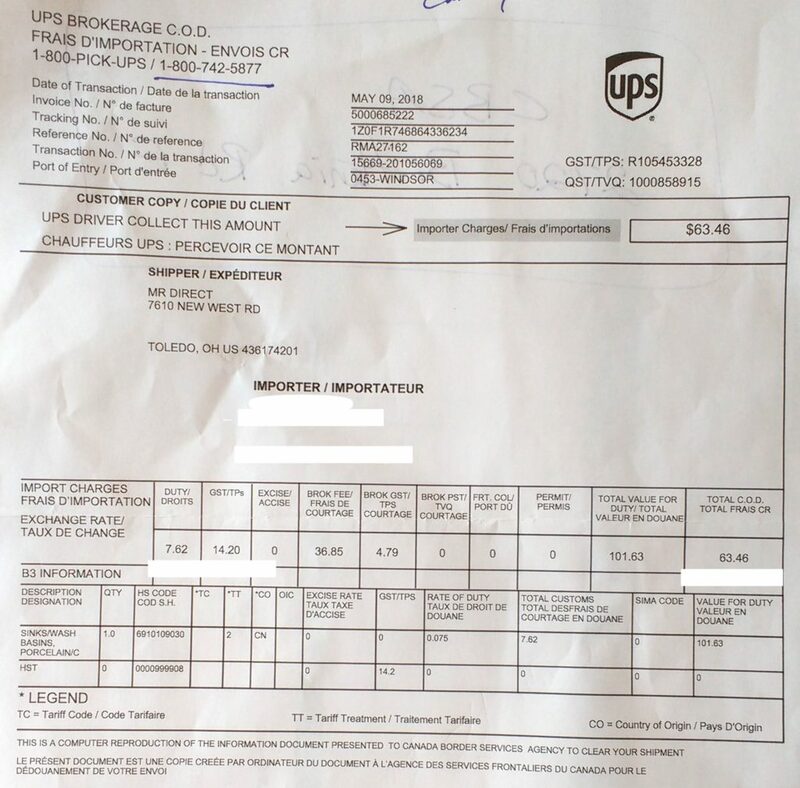 I’ve been screwed by Canadian customs clearing fees three times in the past, once by Canada post (~$16 dollars), once by DHL (~$12), and the worst by UPS (~$30). This time UPS has the gall to try to charge me $71.97 to handle a $2 taxman collection. This package is a set of Christmas gifts from my mom for the kids and us. They’ve been on the road in their 5th wheel for months, and is finally home long enough to send off all the Christmas presents she’d purchased earlier in the year. Mom is honest and itemized the actual values of the items in the package, and this was enough that Canada customs wants to charge me $1.97 to receive it. I’m used to being screwed by the taxman, and would have been willing to pay this to accept the package. Mom says she paid around $50 USD to ship it in the first place, and thinks that she’ll be charged a second time if I sent it back. The basic idea behind this scam is that UPS and some of the other companies handling US -> Canadian shipping have figured out how to collect from both the shipper and the receiver. They collect once explicitly from the shipper in the USA, who may even think that they have paid all the required fees to ship the package, and then they collect again from the receiver by claiming that they have provided a “customs clearing service”. 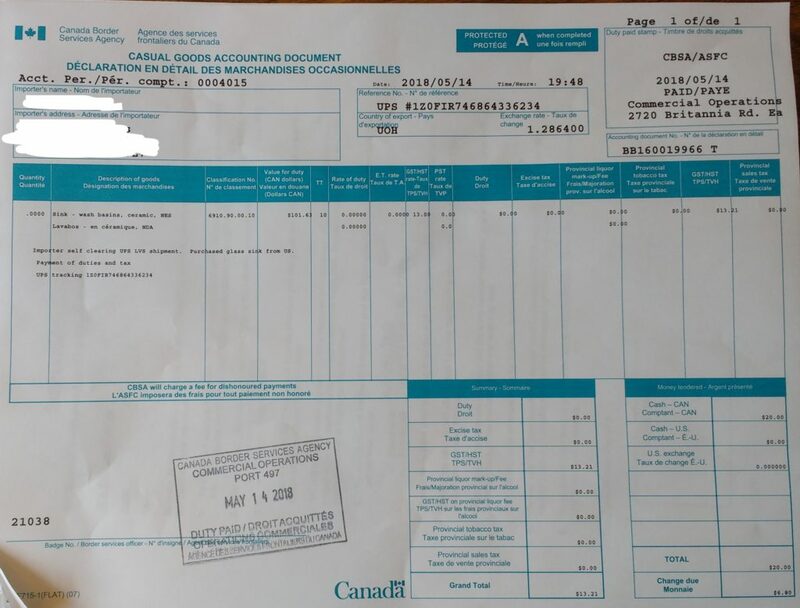 The extent of their service is that they can handle a COD fee for the Canadian government, and keep your package as ransom unless you pay that fee. The actual tax fee that they are collecting is usually peanuts, but they add in their brokerage fee, which is orders of magnitude larger than the small tax imposed. To add insult to injury, they charge you tax (GST) for the extortion “service” they are providing. That GST is also orders of magnitude worse than the tax that was collected on behalf of the Canadian government. It’s win-win for the government, since they get much more than they would have collected originally (in this case $10 instead of $2), and it is certainly win-win for the shipping company, since they get to charge 2x the fees without scaring away the shipper with a higher sticker price. The second time is pure profit, since they don’t have to actually do anything for it. In the past I had a couple people point me to articles on how to do your own customs clearing. 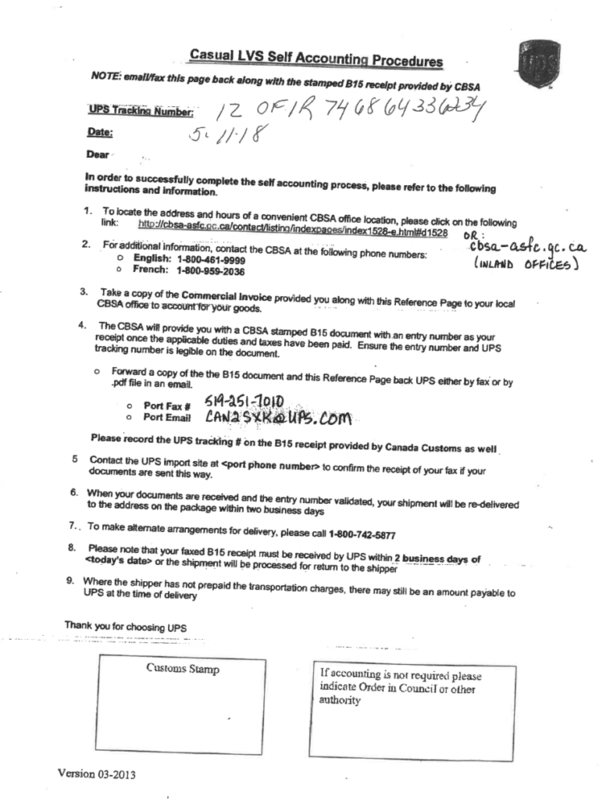 The CBSA website is complete crap, and it’s hard to find out the details for the nearest office. If I look for the Markham area, it looks like there may be an office at the Buttonville airport, but it isn’t obvious that this is open for the public to do clearing services (i.e. it’s not listed as an “inland office” — “A CBSA office classified as a non-direct point of entry providing a full range of CBSA services to the general public”), nor what their hours are, nor is there a phone number to call them to ask. When I called the CBSA 1800 number during business hours, I got no answer. Finding the closest CBSA clearing office is no easier now than a couple years ago. 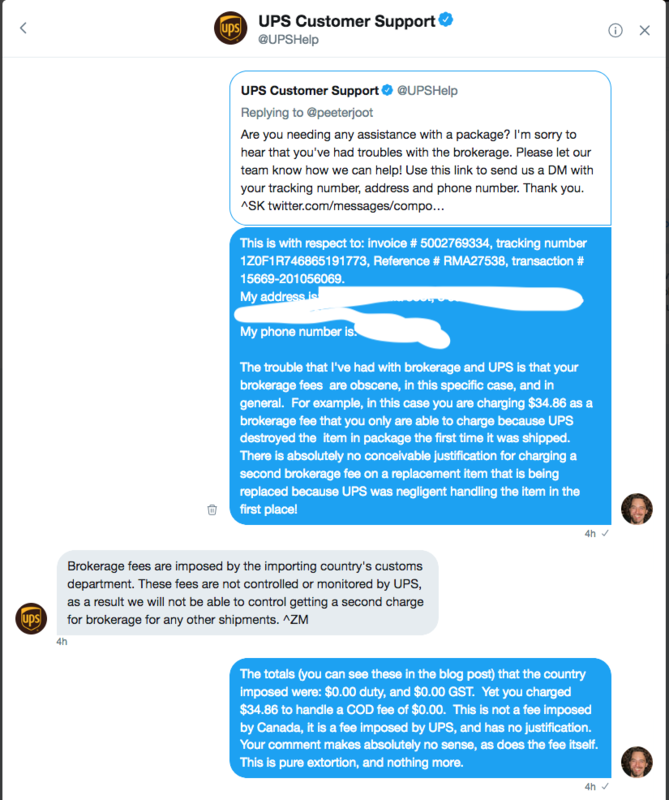 Whenever shipping from the US is mentioned in conversation, I make a point to tell everybody never to use UPS. 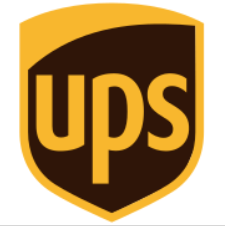 Every Canadian should insist that all their US friends and relatives boycott UPS. As I’m a geek, most of my online purchases are esoteric math and physics, or programming books. I now generally only buy from Canada, India or China. The primary reason that I do this is to ensure that UPS never gets any of my business from a shipper that I cannot control. Mom’s now also been asked to never ever ever use UPS again, and I hope that she spreads the word. If they gouge enough customers eventually they should loose them all. As for this package. I’ve not paid to be screwed this time, and am going to try the self-clearing paperwork myself. I’ll try driving to the Buttonville airport tomorrow and ask in person if they can handle the self-clearing request, or if not where I should go. If anybody has had some personal experience doing self-clearing paperwork in the GTA area, I’d like to know what office you went to obtain your B15 clearing document. Google says that the round trip cost is 2.5 hrs in driving time to avoid the $72 fee.